The team, using zip ties to help fix the robot after accidental contact with another during a qualification match, and, over the sound of buzzing drills and whirring machinery, said they were pleased with their robot’s performance. 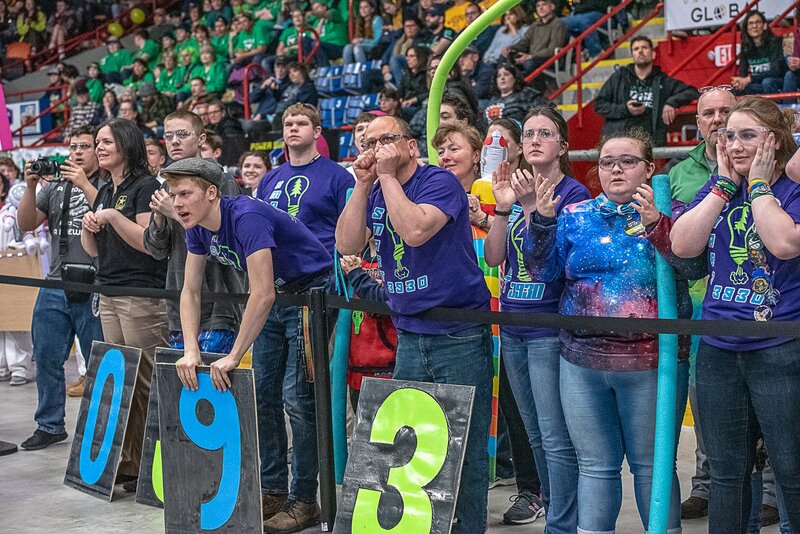 After the competition ended, an alliance that included Baxter Academy for Technology and Science in Portland, Bonny Eagle High School in Standish and Northwestern Regional High School in Winchester, Connecticut, was named the event winner. The runner-up alliance was composed of teams from Gray-New Gloucester High School in Gray, Nashoba Regional in Bolton, Massachusetts, and Milford Area Youth Homeschoolers Enriching Minds in Milford, New Hampshire. The Baxter Academy team also won the Excellence in Engineering Award. 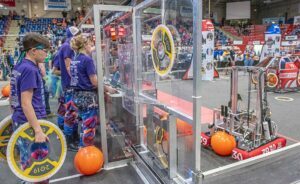 At lunch, teams hustled around a “pit” area in the back of the Colisee, where each team kept a station filled with power tools and technology, fixing parts, and “scouting” for alliances. Getting picked for an alliance is a bit like dodge-ball in gym class: High-ranking teams pick a roster that would do well based on prior performances. After the qualification matches, those not picked by a team in the top eight were sent home. Adam Dustin and George Holt, seniors at Baxter Academy for Technology and Science in Portland, showed a robot, complete with an air-powered lift and a carbon fiber system. As builders, they make sure everything is good to go with their robot. As crowd favorites, they were expected to do well moving forward. The competition season lasts another six weeks. Schools that fare well in this regional competition advance to the New England District Championship in Worcester, Mass. If they make it through the New England Championships, they could move to the FIRST Championship in Detroit.